Ooooo! Yeah! Tell me about Jesus! 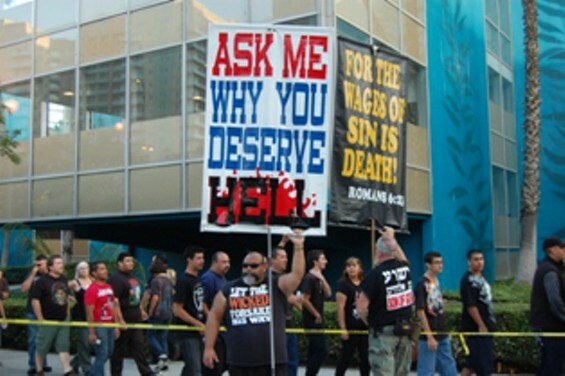 People who threaten others with hellfire and damnation, people who scream, preach, or carry signs that tell people without conversion one faces an eternity of torment: please stop. You are making my job (and the jobs of all who wish to spread the good news of God’s love) harder. I am a campus pastor at the University of Washington — a liberal school in a liberal city in the middle of the spiritual but not religious demographic. Thanks to the work of the hell shouters, a majority of the students here, the students my community seeks to love, embrace, support, feed, teach — to engage in any way, really, are allergic to any mention of the word Jesus. They are, in fact, afraid of even coming near something that might be affiliated with Christianity. Today I was tabling with my students in front of the student center. We had coffee, tea, cookies and a dog with a sign saying “FREE (really) coffee, tea, cookies, puppy love.” The dog drew many in, but they were still tenuous, afraid to take our coffee or cookies because they might have to listen to a spiel about Jesus or salvation or hell. One students straight up asked, “Can I just, like, have a cookie, or do I have to hear about how I am going to hell first.” Over and over again, I had to reassure students that we weren’t there to tell them about Jesus, we weren’t there to threaten them to hell, we were just there to give out things the students need/want: caffeine, cookies, warmth, and love. Some students asked about who we were, why we were doing it. The Muslim Student Association folk asked us about what kind of Christians we are, what we believe in — they gave us the opportunity to speak to them about our faith. However, they did this after twenty minutes of talking about other things, after learning about the Eid party they are having. Our openness to who they are created space and trust enough for us to tell them about who we are. This is how witnessing the gospel works. I have students who have tried to invite friends to our fun activities, but the friends are afraid to come because of what they have seen and heard about Christians. Some are unwilling to come because of their own bad experiences. I so badly want to tell these students about God’s loving grace but all of the hellfire and damnation, the God Hates… rhetoric, the misogyny of many public voices of the church have made it so that I cannot even begin to talk about Jesus until I/we have spent months gaining the trust of those with whom we wish to share God’s message of redemptive grace. A few weeks ago while tabling, I decided a good way to get to know students was to give out coffee/treats but ask a question while doing so. Some students were game (the question was, “What do you value most?”), but one practically ran away as soon as I started to ask a question. I realized that I had gone too far too fast. We need to build up trust with these students before we can even ask some of them to tell us who they are, much less tell them who we are or who Jesus is. They have heard too much hell talk, been threatened with damnation too many time and been witnessed to without invitation too many times to be open to conversation with us. They do not trust us. The is the effect of all of those threats of hell. Not conversion, but alienation and separation. 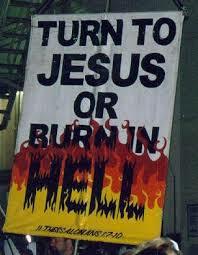 What is the point of telling people that without conversion/repentance they will be damned to hell? Has that ever brought anyone to Christ in the modern era? At one time that might have worked, when most people (at least outwardly) believed in God, when people were walking with death on a daily basis, when hell was depicted in so many stories and so much art. But our lives are very different today. It is acceptable to not believe in God, we are separated from death, and hell is as much mocked as it is feared. 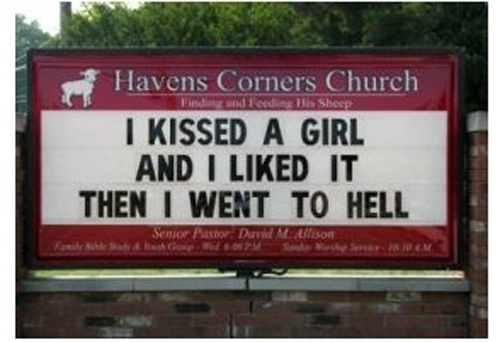 Here’s the thing: most people who don’t believe in God don’t believe in hell. They are not afraid of a place they believe is imaginary. They just think those yelling about it are idiots, at best, hateful jackasses, at worst. Succinct, topical and not helping. So not helping. I don’t want to argue the existence of hell, how a person gets there, what hell is, if it is a here-and-now kind of thing or an afterlife kind of thing. That’s not my point at the moment. My point is if you are someone who believes that those who do not accept Jesus Christ as their Personal Lord and Savior, or those who are not baptized/born again are going to hell, and you sincerely want people to be saved from this torment, telling people they are going to hell is not the best strategy. If you want to witness to people about the love of Jesus Christ, if you want people to be turned around or born again by the glorious word of God’s redemptive, transforming love, show that love. Demonstrate what God’s love looks like. Act in ways that reflect that God’s love lives in your heart. Do what Jesus did — eat with the outcasts, listen to their stories, heal their wounds, feed the hungry and THEN tell those that ask that you are doing these things because of Jesus. Get arrested for feeding the homeless. Protect someone from racial/ethnic/homophobic slurs. Act on/in the love of Christ. Give people a chance to get curious; let people invite you into their hearts and into their lives. Wait for them to offer an opportunity to speak truth to them. Then they are more likely to have ears to hear, more likely to be able to listen, and more likely to open their hearts to God. We are charged with bringing the good news to the world. The good news is the saving grace of God as found in Jesus Christ, not the damning anger of God for those who don’t believe. Help people open their ears and hear. Love them. Care for them. Hold them in prayer. And remember, Jesus is the final judge of who goes where. You aren’t. Help me help you. Help me help you. Help me help you bring the gospel to the world.